'B' Bty, 241st (1/2nd South Midland) Brigade, 48th Division, T.F., B.E.F. George Haughton was born in Bolton, Lancashire and joined the Territorial Artillery based at Malvern sometime before 1913. He went to France with the rest of the 2nd South Midland Brigade at the end of March 1915, he was briefly attached to the 25th Anti-Aircraft Section and was made Acting Bombardier on 17 November 1915. He was admitted to hospital on 29 December 1915. It is unclear why he was admitted, but he returned ten days later. Having signed up for four years’ servce on initial enlistment, he was required to re-engage on 23 March 1916, but perhaps having felt he had done his bit, he initially refused. 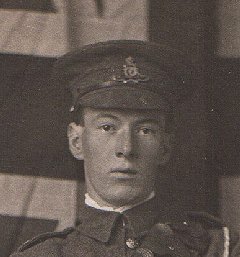 However for whatever reason, he changed his mind (or had had his mind changed) and re-engaged on 13 May 1916. Bdr Haughton was killed during the Battle of Passchendaele when the 48th Division was attacking German positions near St Jan, a few miles outside Ypres. Read more about the actions on the Steenbeek, near Langemarck at the opening of the Passchendaele Offensive here.